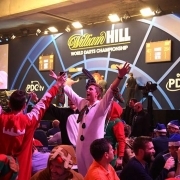 You are here: Home / Blog / PDC / Want to watch the PDC World Championships? $3.1 Million Prize Fund at Alexandria Palace! 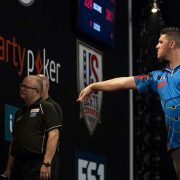 It’s never been a better time to be a darts fan in the USA and the world! The UK’s second most popular televised sport (No joke! it’s #2 after “football/soccer”) has never been more popular with global viewership on the rise. 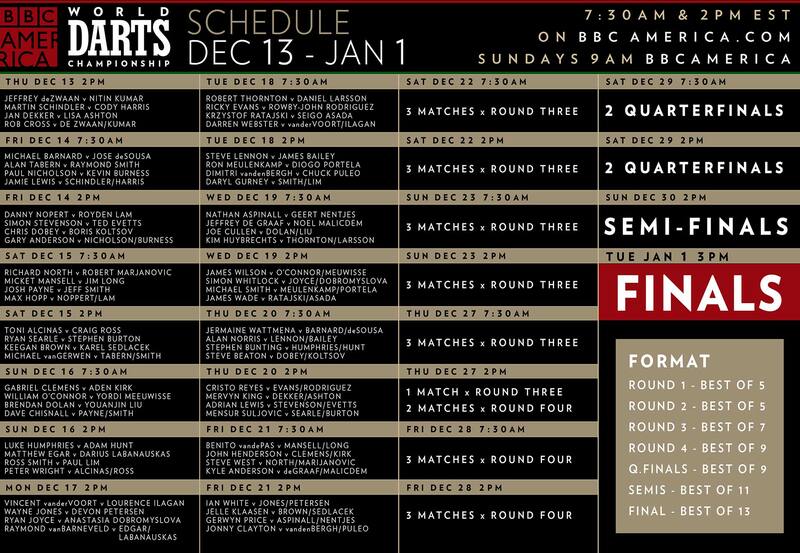 BBC America will be covering the illustrious Professional Darts Corporation’s World Championships from December 13 to January 1st so you can watch every match through the holidays. This year’s field has expanded to 96 players from around the globe, including 2 female qualifiers and 3 North Americans. See below for a complete schedule and links on where to watch, then click here for our scouting report on the North American players. Where can I Watch in the USA? You can watch the entire LIVE competition streamed on BBC America’s website and Facebook Page. 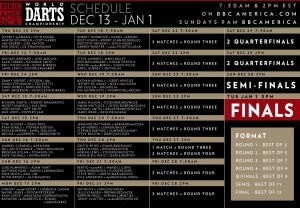 See the detailed match schedule below to see all the juicy matchups. In addition to being streamed LIVE on BBC America’s website and Facebook Page, this will air on BBC America’s standard cable/satellite channel, check your local listings for the channel # in your area. This will immediately follow the Doctor Who New Year’s Day special. In the United States, watch 3 hours of coverage from BBC America’s standard channel on your local cable/satellite provider. Check your local listings for the correct channel # in your region. Where can I watch outside the USA? For standard television options, check the PDC website for the most up to date information for your country/region. 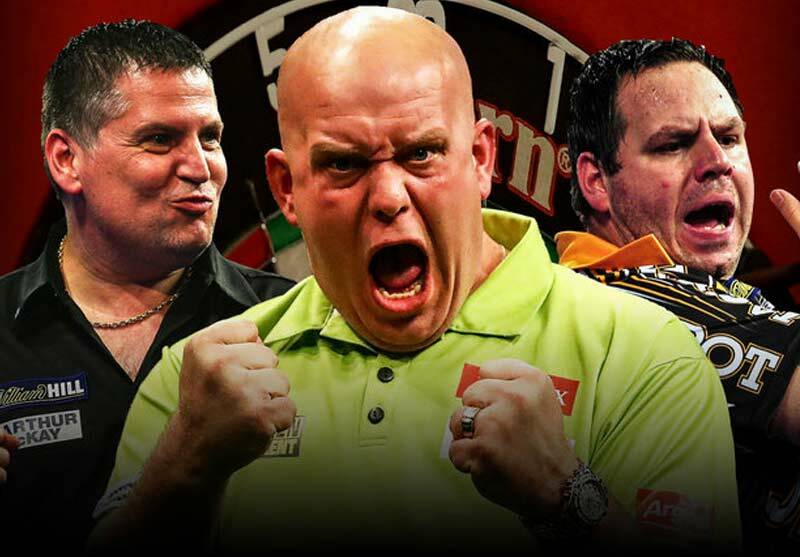 Subscribers to Sky Sports in the UK can watch the entire competition on their dedicated channel, Sky Sports Darts. For almost everywhere in the world, you can subscribe to PDCTV-HD, the PDC’s official streaming service. Sign up for a 7-day free trial before continuing your subscription for the World Championships, plus gain access to exclusive PDC tournaments throughout the year. A complete list of every match for each day. Get behind the North Americans! What are the chances for an underdog upset? Take a closer look at the USA and Canada by the numbers. https://www.dartconnect.com/wp-content/uploads/PDC-1.jpg 557 800 Gregg Tong Gregg Tong2018-12-11 16:56:382018-12-26 21:09:10Want to watch the PDC World Championships?